No problem. These are really great. Thanks for all the hard work you have put into all of them! 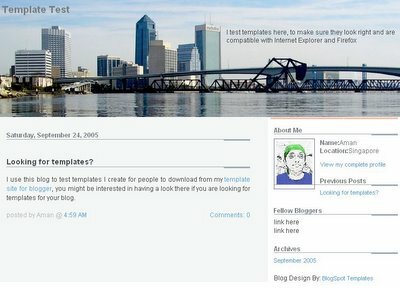 I want this template, except with a different picture of jacksonville..btw i live in jacksonville also! excelent template! but how can i change the picture? I really appreciate the fact that you entered a Miami skyline. Any chance you could enter a skyline picture taken at night, with 2 types of layouts: 1: that similar to the Hong Kong and Singapore ones 2: that similar to the Esplanade layout. Thanks. I'll owe you a mixed cd if you get this right! Hey, great template, but I was wondering if you could point out where in the code it gives the color for the main blog post section. I would like to change the color from that slight gray that is currently in use. Please help, somebody? i'd also like to change the picture. i'd like to have one of vancouver canada in it. i've already got photopucket but the picture won't appear. can i send you my tags? could you change it? 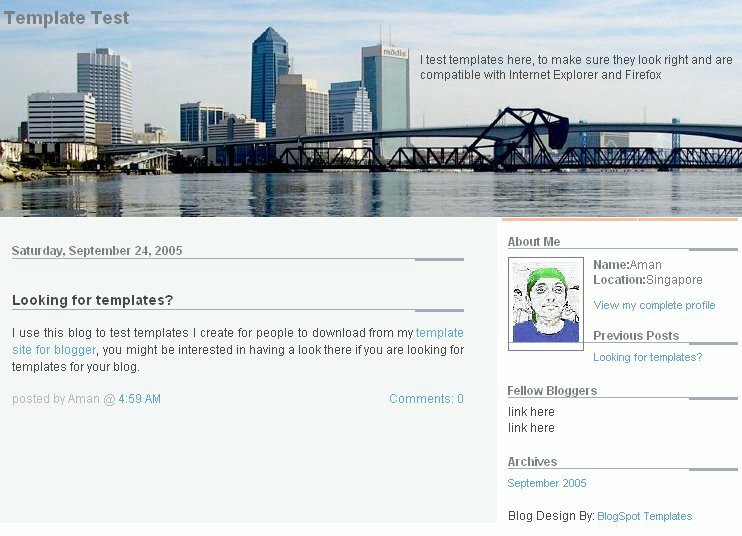 The template is great, just one small problem I'm having, I can't get rid of the name of my blog up the top in the left corner where on the template it says "template test". If you could help me it would be greatly appreciated! This one. I love this; simple and corporate style looking. That's Jacksonville, FL not Miami. That view in the picture is almost the same as outside my office window. Jax is better then Miami anyway. Hey. I really love this one! Great work! Would you mind sending the codes, "Get Template" isn't working for me. Thanks! thanx 4 sharing this!! greetings from mexico. Non è stato possibile analizzare il tuo modello, in quanto non è strutturato correttamente. Assicurati che tutti gli elementi XML presentino il tag di chiusura richiesto. Messaggio di errore XML: The content of elements must consist of well-formed character data or markup. Why is there an error? Can somebody upload it somewhere else please.